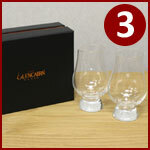 At number 1, is the ultimate set for any Whisky drinking enthusiast, our very own Glencairn Set. The Glencairn Whisky glass is known worldwide and is used by drinkers, enthusiasts, master blenders and more! Our combined set comprises of a set of 6 official whisky glasses, 1 whisky water jug in the same style (used for adding water to open up the aromas) and 6 Glencairn tasting caps, designed to help contain the vapours within the glass to maximise the taste and flavour. 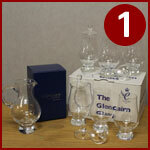 What’s included: 6 x Glencairn Official Whisky Glasses, 1 x Glencairn Water / Whisky Jug, 6 x Glencairn Whisky Glass Tasting Cap. If you’re looking for something similar to the above, the 2 glass and jug set fits the bill. Presented in a gift box, this perfect gift allows your lucky recipient to enjoy the Glencairn experience. The 2 glasses will really enhance the whisky drinking experience as it’s designed to hold as much flavour and keep the aromas within the glass. The similar styled jug allows you to add a touch of water to your whisky. 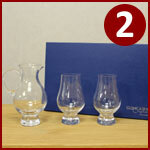 What’s included: 2 x Glencairn Official Whisky Glasses, 1 x Glencairn Water / Whisky Jug. Gift boxed. The 2 glass Glencairn set makes for a great gift for someone who enjoys the occasional drop of a good Whisky. It’s a great present as it’s supplied in a gift box, adding a touch of class; to what already is a great product! The traditional whisky tumbler has been replaced with this classy and unique whisky glass, it’s seen around the World accompanying many great whiskies. What’s included: 2 x Glencairn Official Whisky Glasses. Gift boxed. 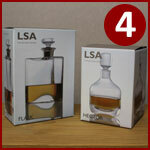 Our collection of Spirit Decanters from LSA would look fantastic in any drinks cabinet. Our spirit decanters are all handmade, perfect for holding all types of Whisky, Cognac, Brandy or Port! They’re heavy and will sit nicely in a cabinet or on the table while you enjoy one of your favourites. What’s included: Spirit Decanter, suitable for Whisky, Cognac, Brandy and much more! Gift boxed. If your recipient is lucky enough to receive a Whisky Nosing Aroma Kit, they’ll really feel like a Whisky enthusiast! This nosing set features 24 different aromas that you’re likely to find in Whisky, it helps you to develop your sense of smell and educates you further in the World of Whisky. There is guide included, as well as blank aroma strips, so you’re able to dip these into the likes of Caramel, Fruity, Vanilla and Spicy! It is also available in a set of 12. What’s included: 24 x Aroma Solutions, Guide / Trading Manual, Blank Aroma Strips, Aroma / Flavour Record Sheet, Gift boxed. So there we have it, Wineware’s Top 5 Whisky Gifts…perfect for Christmas! Click here if you would like to view our extensive range of Whisky glasses, from manufactures such as Glencairn, Riedel, Schott Zwiesel and Spiegelau! Alternatively, if you really can’t decide on what to give your loved ones this Christmas, why not let them decide with a Wineware Gift Voucher.